Matanuska Lakes is only one small portion of the Matanuska Green belt. The park encompasses over 300 acres and has more than 50 miles of non-motorized trails. There are four lakes within the park; Matanuska, Canoe, Irene and Long Lake-All have excellent fishing! Only electric motors are allowed on the lakes. There are 10 Campsites for Tents and RV's. From Anchorage: Take the Glenn Highway North to Mile 36.4, turn left into the Park entrance from the highway. From Wasilla: Take the Parks Hwy. to the Glenn HWY. interchange, take the Glenn Hwy. Eastbound (toward Palmer) Mile 36.4 is at the top of the hill about 1/4 mile from the Parks/Glenn interchange. The main campground entrance is a gravel road on your left at the top of the hill. The Matanuska Greenbelt is a large tract of public lands between the Palmer-Wasilla Highway, Glenn Highway, Parks Highway, and Trunk Road. The lands are owned by Matanuska-Susitna Borough (Crevasse-Moraine Trails=MSB CMT), UAA Matanuska-Susitna College, UAF Matanuska Experiment Farm, and Alaska State Parks (Matanuska Lakes State Recreation Area=MLSRA). The area is known for its challenging trails as well as it's agriculture and history. There are over 50 miles of trails accessible to the public, the area boasts some of the nicest off-road biking in the Valley. It has also become extremely popular with geo-cachers. Most of the 50+miles of trail have now been signed with a few more to be added yet. The area is non-motorized although there may be authorized vehicles (tractors) working the farm lands. Individual agency lands may have rules specific to them and not other areas of the Greenbelt. Please respect the desires of the agencies (such as staying off planted agricultural fields) so public use can continue to be enhanced on these trails. Tent sites 1-6, Upper Camping loop. 1- Medium site suitable for small-medium RV or two medium tents. This site has 2 parking spaces, and is shaded. 2- Small site suitable for a small RV or small tent. 1 parking space, shaded. 3- Small site suitable for a small RV or small tent. 1 parking space, shaded. Sites 1-3 can be reserved together for group camping. 4- Large site suitable for tents or truck camper only. Cul-de-sac parking. 5- Large site suitable for tents or truck camper only. Cul-de-sac parking. Sites 5 & 6 can be reserved together for large groups with several small tents. These sites along the tree line are for RV’s and Campers. The area is very rocky. Each site a picnic table and fire ring. Additional RV camping is allowed in this area when campground is full, over flow campers will not have picnic tables or fire rings. Use of personal fire pits is allowed. 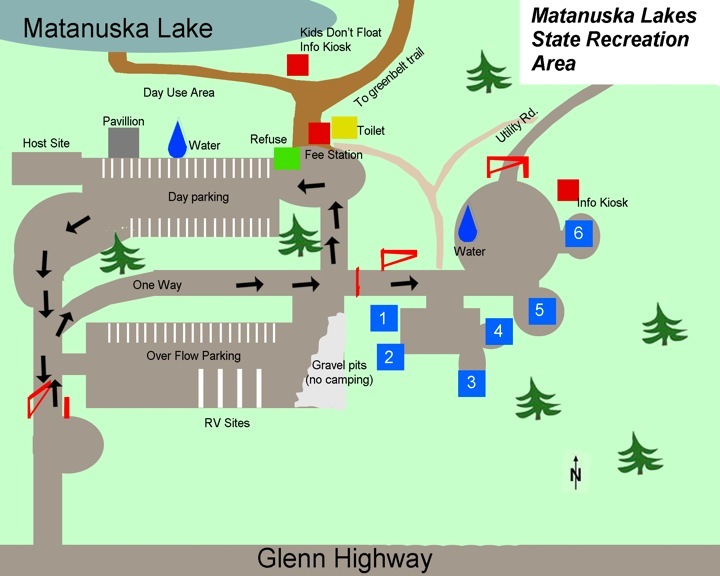 Matanuska Lakes is open for Winter Day Use!